Athletes in Rio will compete to be the fastest sprinter and highest jumper at the Olympics this August. But there's another test underway as well: How well can virtual reality capture sporting events? NBC says it will provide 85 hours of virtual reality programming during the Rio Olympics in August — though only to users of Samsung Galaxy smartphones and the Samsung Gear VR headset. It's the first time Olympics programming will be available in VR. Virtual reality coverage of sports, essentially 360 video, has been growing since VR headsets such as the Samsung Gear and Oculus Rift became widely available earlier this year. Sports broadcasters are betting that virtual reality will be the next big game-changing way to watch sports. But right now, the audience is limited to those that have smartphones and VR headsets, which can be pricey. Still, coverage is growing. In May, NBC broadcast the Kentucky Derby in 360 video. The NBA has broadcast some of its games in virtual reality, and Fox Sports broadcast VR streams from the U.S. Open at Oakmont in June. 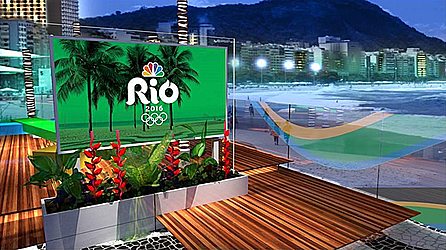 Gary Zenkel, President, NBC Olympics, said Rio will be a showcase for the "cutting-edge" technology. The Olympics video, which will be presented on delay during the games, will include opening and closing ceremonies, men's basketball, gymnastics, and track-and-field events. Other virtualized sports will include beach volleyball, diving, boxing and fencing. NBC will also release VR highlight packages of those sports. The VR video itself will be captured by Olympic Broadcasting Services, a unit of the International Olympic Committee that provides video feeds to international broadcasters. Viewers will need Samsung devices and the NBC Sports app. Samsung is the official smartphone sponsor of the 2016 Olympics in Rio. Compatible phones include the Samsung Galaxy S7, Galaxy S7 Edge, Galaxy S6, Galaxy S6 Edge, Galaxy S6 Edge+ and Galaxy Note 5 phones. Other Olympics sponsors have been jumping on the virtual reality bandwagon too. Kellogg's, which sponsors Team USA, shot Olympics contender Tom Shields in 360 video as he practiced underwater for a marketing effort that appeared online and at an event in New York.